Gal Foodie® | Life Is Short! Eat Well! I’ve considered apologizing for my latest disappearing act, but no. There’s no apology for living a full life. Nope. Not ever. So, whatcha been doin’ Gal Foodie? And there’s the rub. I don’t even know where to begin. There was a winter… Of love, of discontent, of hot wings and football and nacho dip. Of Pho and fennel and stews and muffins. Of crossword puzzle races while we cooked. And lots and lots of wine. There was another goodbye, and another Spring of packing up the kitchen and moving to greener pastures. Summer, oh summer! Sailing picnics and saltwater, yoga on the dock and wine and cheese and fresh eggs and eating the first tomatoes of the season, right there in the grass, for breakfast. The radio show with so many wonderful guests, and writing articles and recipes for Northeast Flavor Magazine. There’s judging the Maine State BBQ Competition next weekend (oh, please no oysters this year! ), a few catering gigs, lots of dining al fresco, and very soon, there will be packing again for a 6 month trip to Europe, which I’ll be writing about on my new blog, ADRIFT. And, there was the opening of an art gallery. Yes. Drift Contemporary Art Gallery. As if there wasn’t already enough to do. And so I leave you with this for now. Life is short. Live it. I couldn’t be happier. This entry was posted in Uncategorized and tagged edible flowers, fennel, flowers, football, ice cream, muffins, nacho dip, noodles, pho, Spring, summer on August 5, 2010 by galfoodie. Time in the kitchen has been short and sweet these days. I’ve been focusing on making large amounts of one thing, and then eating it for days. It’s the price I pay for being overworked and underpaid. But I don’t mind. 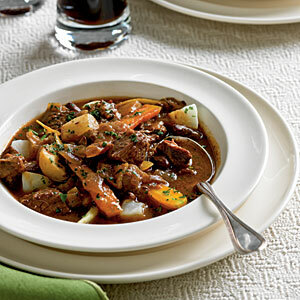 Especially if it’s this fabulous Guinness Stew. I’d like to say I came up with this all on my own. I’m quite surprised I didn’t actually, since it includes all the components of my beef stew, with the addition of some other yummy ingredients that I should have been adding to my beef stew all along (like parsnips!!). It’s from Cooking Light magazine, and it’s to die for. This is not a quick stew. All told it took me about 4 hours to make. But the house smelled divine all day, and the end result (especially the day after) was a warm and wonderful, hearty stew filled with delish root veggies, raisins, caraway seeds, and best of all, Guinness. The whole meal rounds out nicely with a my Grandma Murphy’s Irish Soda Bread, and, well, more Guinness. 1. Heat 1 tablespoon oil in a Dutch oven over medium-high heat. Add 1 1/2 teaspoons butter to pan. Place flour in a shallow dish. Sprinkle beef with 1/2 teaspoon salt; dredge beef in flour. Add half of beef to pan; cook 5 minutes, turning to brown on all sides. Remove beef from pan with a slotted spoon. Repeat procedure with remaining 1 tablespoon oil, 1 1/2 teaspoons butter, and beef. 2. Add onion to pan; cook 5 minutes or until tender, stirring occasionally. Stir in tomato paste; cook 1 minute, stirring frequently. Stir in broth and beer, scraping pan to loosen browned bits. Return meat to pan. Stir in remaining 1/2 teaspoon salt, raisins, caraway seeds, and pepper; bring to a boil. Cover, reduce heat, and simmer 1 hour, stirring occasionally. Uncover and bring to a boil. Cook 50 minutes, stirring occasionally. Add carrot, parsnip, and turnip. Cover, reduce heat to low, and simmer 30 minutes, stirring occasionally. Uncover and bring to a boil; cook 10 minutes or until vegetables are tender. Sprinkle with parsley. May the road rise up to meet you – feet first! This entry was posted in Uncategorized and tagged beef stew, guinness, irish, irish soda bread, Murphy, parsnip recipe, parsnips, recipe, saint patrick's day, st. pat's, stew, turnip on March 16, 2010 by galfoodie. OK, OK, OK. I know it’s WAYYYYY past Valentine’s Day. And I am weeks overdue in posting our winner of the recipe contest. Several freak illnesses, a few major storms that knocked out utilities, and one Valentine’s Day later, we have a winner! This is a recipe I got from the tag hanging from a bottle of Amaretto di Saranno over 30 years ago. I was in college at the time and it is one of the first meals I made for my boyfriend, who is now my husband. He still calls it the “wooing meal”. Every time I make it I think back to those days when our love was new. Cut chicken breasts into 1-inch slices. Sprinkle with salt, pepper, curry powder and garlic powder. Dredge in flour. Saute in melted butter until brown on all sides. Add mushrooms, Amaretto and lemon juice. Simmer 5 minutes. Mix chicken broth with cornstarch. Pour over chicken. Simmer until sauce thickens. Serve over patty shells or cooked white rice. Note: If you’re cutting down on fat, you can make this using just 2 tbsp. of butter and it’s almost just as good. It was so hard to choose a favorite (oh my job is so hard! ), so I wanted to share with you one more recipe that made it to the top of the list. It was submitted by Kimberly Woods, and we LOVE it! This is one of my favorite recipes to make for romantic sleepovers. It is also perfect for a Mother’s Day breakfast in bed. Children enjoy the strawberries and love when a cookie cutter is used to make the french toast into a fun shape (heart, star, etc). In large bowl, beat together milk, eggs, vanilla, cinnamon, and sugar. Cut slices of bread horizontally to form a pocket. Set aside 1 cup of sliced strawberries for garnish. Place remaining strawberry slices and brie in bread pockets. Dip bread slices in egg mixture, coating them completely. Place bread slices on a plate, cover and chill for 20 minutes in the refrigerator. In large frying pan, melt butter over medium heat. Add bread slices, cooking on each side about 2 minutes or until golden and cheese starts to melt. Remove from pan, dust with powdered sugar and garnish with strawberries. Serve immediately with maple syrup. Either of these recipes is a great excuse to dish up some love in your kitchen! This entry was posted in Recipe Contests and tagged Amaretto, brie, chicken, chicken btoth, cinnamon, curry, French Toast, garlic, lemon juice, love, maple syrup, meal, meals for lovers, mother's day, mushrooms, old recipes, pasta, rice, strawberry, valentine's day, Wooing on March 3, 2010 by galfoodie. Do you LOVE food? Do you LOVE making it for someone special? Then I want to hear about it! This month’s Gal Foodie Recipe Contest is all about dishin’ up love! Send me the recipe you love to make for the person or people you love the most! I’ll post it in time for Valentine’s Day. 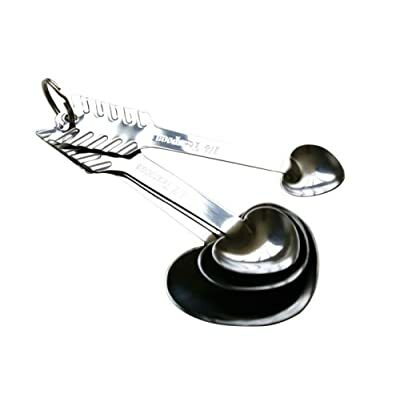 I’m giving away a set of the sweetest Stainless Steel Cupid Measuring Spoons, in exchange for your submission of the winning recipe! 1. Send me your favorite recipe for a food that inspires love. The deal, as always, is you also MUST tell me WHY this is “love” food to you. And keep it clean! I prefer original recipes, however if you have one from a book or other resource YOU MUST disclose the source. Entries that appear to be plagiarized with no cited source will be tossed like a salad. 2. If I select your recipe, it will be published on the Gal Foodie website along with your photo and you will also receive a set of Stainless Steel Cupid Measuring Spoons. 4. Deadline for submission is February 10, 2010. This entry was posted in Recipe Contests and tagged being in love, contest, cookbook, cooking contest, food, food blog, food contest, love, measuring, recipe contest, spoons, sweets on January 16, 2010 by galfoodie. What I love about old family recipes is that there is usually a story. Over time, the story inevitably gets diluted. The handwriting gets smudged, the facts get a little flour on them, the names become a mystery. But the story always ends the same. “This is a food I know.” And with time-traveling delight, these are the recipes that keep our traditions strong, and the tale of the person who made it before us, tangible. In my family history book, there is a cake. And you can be sure there is a story. New Zealand is a far away, mythical place for most of us. For my Grandmother, it was home the first few years of her life. While I don’t know the whole story, I know the parts that have helped me understand who I am and where I get my strength and independence. It is the story of Great-Grandmother Lucretia Cattley, who alone, in 1919, packed up her 4 children and a few keepsakes, and crossed a giant sea from New Plymouth, New Zealand, to a small town called Melrose, in the State of Massachusetts. Without a husband to speak for her, she convinced a local bank to lend her enough money to buy a house. With a meager income from odd jobs, she made payments of 50 cents a week to the man at the bank, and alone, she paid for that house, and in it, she raised her 3 daughters, Amy, Eleanor, and Marjorie and her son, Henry. Surviving the adventure across the sea is a recipe for New Zealand Birthday Cake. My Grandmother’s handwriting on an otherwise neatly typed card in her recipe box states that this is her Grandmother’s recipe. How many women in my family wrote that recipe down, or recited it in a kitchen far away to be made on someone’s special day? That’s a lot of years in one cake pan. At least five generations of my family, and nary a birthday has been celebrated without it. My beloved Grandmother is gone now, but for 32 years she and I shared a birthday. Every year she made the two of us the New Zealand Birthday Cake, and never once, did she forget to tell me where it came from. Everything, including the recipe, had been committed to memory, and the most important task in making the cake was telling the story. Last night, for my father’s 63rd birthday, my sister made the cake and the story was shared again. And all of those women were sitting with us for a slice. There are no directions on this recipe card, save a scribble from my Grandmother that tells me to cream the first 3 ingredients together, and that 3/4lb of something equals 1 1/2 cups. I have always used my Grandmother’s 9×13” pan. The comment from my Mother is that this is one of the driest cakes she’s ever had the “pleasure” of eating. At the risk of altering the story, I am experimenting with cooking times – thinking that if I increase the temperature and significantly reduce the time in the oven, it may not be so “pleasurably” dry. No matter what, this story always ends with gobs of plain white frosting and homemade vanilla ice cream. Bake at 340 degrees for 1 ½ to 2 hours. Find your recipes and share their stories. This entry was posted in Uncategorized and tagged baking, birthday, cake, cake-recipe, celebrate, citron, cooking, Dad, family, father, Grandmother, mace, melrose, new-plymouth, New-Zealand, nuts, recipe, recipes, story-telling, tradition, walnuts on January 8, 2010 by galfoodie. I’ve been away awhile. Well, I’ve actually been right here all along, but just this morning I’ve been trying to figure out how to explain to you the analogy between life and running a restaurant. How they are so frighteningly similar, that I wonder why I ever bothered with a restaurant at all, when I already had a life. Every day is defined by who walks through the door, both in and out. The people who run the place and the people who are just passing through looking for a little comfort, and a little sustenance. Someone quits and there’s a scramble to make up for the lost set of hands, and sometimes something you need doesn’t show up, but something else arrives in it’s place, and you make do with what you have because that’s the best you can do on short notice. Sometimes it’s a perfect night, and sometimes the morning comes way too early. You put your whole heart into it. And then something important breaks and you have to let it all go until you can figure out what it’s going to take to fix it. You stand up, you show up, and you go to your station and begin again every day, because there are expectations to be met and things that need doing. I couldn’t have guessed that I would have had the life or the experiences that I’ve had in my short 36 years, and I couldn’t have seen the life I would be living these last few months for all the tea in China. But it happens, life. And restaurant or not, there’s always someone coming, or going. And there’s always something to do. And plenty to write about. I moved and it started to rain. It rained so much that Summer barely had a chance to get here before the Fall. And in the torrents, the love of my life left for greener grass. Even coated in fresh paint, my new kitchen was too dark and depressing to feel good in. I ate by myself, and I cursed the rain. And then I decided that there was too much to be missed, rain be damned, and I ventured out into my new food world and instead of cooking, I met the people who cook. I visited restaurants and started asking questions. I was asked to be a judge for the State BBQ competition, and in so doing, met a wonderful group of very accomplished chefs and restaurant owners who opened more doors. (Not to mention I learned that oysters and BBQ sauce don’t mix) I became the co-host of a radio show about food with a gal I had imagined would be a soul mate if only I could meet her. I ate fried olives and fluke ceviche with yuzu ver jus, pickled fresno chili, and sea beans and wondered where they had been all my life. Kitchens were bustling in my presence and tables were filling up. And Gal Foodie was getting her gazpacho back. And then a phone rang with the horror – a child had been killed in a terrible car accident, and my world screeched sideways all the way back to my beloved Mount Desert Island. The only thing I knew how to do to make it all better was to cook. And cook, and cook. Until everyone at least had a decent meal in their stomachs even if their hearts were bleeding out of their chests. It was that same child that I had fed in my old kitchen for so many years whom I had already said goodbye to a few months earlier. Goodbye to my island, the life I’d built, my sweetest love – No – this eclipsed any farewell I’d ever known. I kissed the tops of their heads and fed their souls but the child was gone, the kitchen was gone. No amount of food could fill that hole. With all the heartache-encrusted strength I could muster, I headed once again from the old to the new, determined to find the recipe for moving on. I made cheese for the challenge of it. I spent time on the Eastern Shore of Maryland and made crab cakes with the real thing and drank cheap beer at a place called Lucky’s Last Chance. A cookbook idea led to fairgrounds across the Northeast, where I consumed foods with names like the Craz-E-Burger. Despite the implied calorie count (who was counting?) there was a story there and so I grabbed for extra napkins and I kept eating. As a judge at the local chili festival, I met even more people who cooked, and people who published magazines about it. I learned how to make bean hole baked beans for 1,000 people, and roast an ox on a spit. I was recognized in public. And I finally started cooking in my new kitchen. There is no recipe for this. There is no one way it can go. Sometimes you get lucky. You keep trying new things, testing new ingredients and hoping it turns out OK. And you don’t always get to decide who stays and who goes. You can only trust yourself to keep showing up and doing what needs to be done – the rest is left to Chance. This entry was posted in Uncategorized and tagged baking, BBQ, ceviche, Chance, chili, cooking, crab cakes, family, food, kitchen, lobster, maryland, mount desert island, olives, restaurant, summer on October 24, 2009 by galfoodie. Gal Foodie is on Facebook! Go to the Gal Foodie Facebook Page and become a FAN today! This entry was posted in Uncategorized on October 14, 2009 by galfoodie. A mad scientist friend of mine suggested we try making fresh mozzarella this weekend and I jumped at the chance. I had no idea where to start, and was given a simple list for shopping. Buy a gallon of pasteurized whole milk and lots of tomatoes. Yup. Tomatoes. You can probably guess that there’s more to making cheese than milk. And that tomatoes probably don’t have much to do with making cheese. And you’d be right. The mad scientist showed up with citric acid and rennet, 2 ingredients instrumental to creating cheese curd. He also makes a mean tomato sauce. After a bottle of homemade Elderberry wine was uncorked, poured, and partially consumed, we set to making cheese. We probably should have waited to open the wine, as our first batch of curd, well, didn’t really “curd” the way we needed it, because we were too busy being silly, and not busy enough watching the thermometer. In fairness to the scientist, I should note that as we were reading the directions online, the guy switched from Fahrenheit to Celsius, and this critical after-the-fact find isn’t helpful if you have a sensitive concoction on the stove. So I won’t blame the mad scientist for either mishap. I enjoyed the wine and we didn’t let the first batch of curd go to waste. The mad scientist went to work quickly on our mishap, straining and draining and squeezing and kneading, and the result was a boursin-like cheese that with a little roasted garlic butter (which we had made a few days earlier to put on our flat irons) and some basic herbs, became a delectable spread that tastes amazing on just about anything. So, did we actually make mozzarella? Yes! After another trip to the store for more milk, and another glass of wine (or 2), we went through the whole process again, and the curd formed a nice solid chunk that we were able to cut with a knife. We then proceeded to go through the strain, reheat, strain, reheat, knead process and the result was cheese curds everywhere and an incredible full-size ball of fresh mozzarella. And it TASTED like mozzarella. It actually sliced much cleaner than what you would buy in the store, and because it had not been sitting in a brine for weeks, our palettes were expecting it to be little more salty, and so we decided that next time, we would add just a touch more. What we ultimately created was a wonderful afternoon full of good food, wine, laughs and lots of dishes. The mozzarella landed on grilled pizza where the sauce, caramelized onions and the dough were also made from scratch, as well as a few fresh sliced tomatoes with basil and vinegar. We hatched a plan for more cheesemaking in our future, that included buying a few goats (ok – maybe that was the wine talking), and we’ll share that whole experience with you too! For now, see a quick list below of what you’ll need for making your own mozzarella, as well as a link to the instructions we followed. It is extremely important to watch the heat and the time. Don’t let the milk get above 90ºF. Have lots of towels around as making cheese curd is messy business. It really helps to have 2 people. The straining process is a lot of back and forth, and it really helped to have one person holding the big pot, while the other holds the strainer and kneads. We used this website as our basis for the recipe/process. I suggest you read it through carefully from start to finish because timing and heat is crucial to success. Greek olives, basil and salami. We heated the pizza stone on the grill, but would suggest pre-cooking the crust for about 5 minutes before adding the toppings and putting it back on the grill. Watch the bottom! It will burn fast if the heat is too high. Add a couple of cold beers, and a great view and you have yourself a really nice afternoon. This entry was posted in Uncategorized and tagged basil, Beecher's, cheese, cheesemaking, citric-acid, cooking, corona, curd, elderberry, pizza, rennet, seas-salt, tomato, wine on August 18, 2009 by galfoodie. Not only do I love good BBQ (I’m planning my next road trip to the South based around the Lee Bros. Southern Cookbook) … I’m a V.I.P Judge for the State Competition this Saturday!! Five food experts judge at the Celebrate MAINE Festival’s (www.celebrateMAINEfestival.com) inaugural event, “Mainely Grillin’ and Chillin’ Country BBQ State Competition” in Eliot, Maine. They will be judging Iron Chef Competition on Saturday, August 8th. James King, Director of Marketing, J.P.’s Shellfish. James has worked with shellfish throughout his entire life. He expanded this experience to a professional level through 20 years of work at premium restaurants and distributors. Raised in the coastal community of Kittery, Maine, James took the ocean like a fish takes to…He really liked it. At a very early age, James came to appreciate the Earth’s oceans as an invaluable, yet terrifically fragile, resource. He champions environmentally sustainable fisheries and the premium product distributed by J.P.’s Shellfish. Jean Kerr, Editor, Taste of the Seacoast Magazine. Jean Kerr has been writing and publishing books for more than twenty years. She is Editor of Taste of the Seacoast, the Boston-Portland, Maine food and wine magazine. She is author of Mystic Seafood, Union Oyster House Cookbook, and the forthcoming Windjammer Cooking: Recipes from Maine’s Windjammer Fleet. Ali Goodwin, blogger, www.galfoodie.com. Ali Goodwin, a.k.a Gal Foodie shares her passion for great food through stories and recipes surrounding her day-to-day culinary adventures @GalFoodie.com. An award-winning specialty food designer and former restaurant owner, Gal Foodie shows you what she’s cooking, where she’s dining, her “foodie” favorites, and more. Life is short. Eat well! Kathy Gunst, World Renowned Food Entrepreneur. Kathy Gust, former Culinary Editor for Food & Wine, is the author of 13 cookbooks. Her most recent books, Stonewall Kitchen Breakfast and Stonewall Kitchen Winter Celebrations will be out this fall, Chronicle Books. She is the “Resident Chef” for WBUR’s award-winning show, Here and Now, heard on over 150 public radio stations. She writes a blog for Down East called “Notes from a Maine Kitchen” found on www.downeast.com. Rachel Forrest, Food and Dining Editor & Content Manager, Dow Jones Media Group & The Portsmouth Herald. Rachel Forrest is the restaurant critic, food writer and food editor for the Portsmouth Herald and Dow Jones Local Media Group. She has written about food and drink for Taste of the Seacoast, Accent, Yankee and NH Magazines and is co-authoring a new cookbook all about Maine cuisine with Arrows Restaurant chefs Mark Gaier and Clark Frasier due out next year. Her radio show, Wine Me Dine Me can be heard on alternate Wednesdays at noon on Portsmouth Community Radio. Celebrate MAINE Festival (www.celebrateMAINEfestival.com) is an authentic family event that honors the people, places and products that make Maine so attractive to visitors from around the world. It is held August 8-9 from 10 a.m. – 4 p.m. at the Raitt Homestead Farm Museum, 2077 State Road, Eliot, Maine. Admission is $5.00 per person, children 12 and under are free. Plenty of free on-site parking. FMI: (207) 748-3303. Premium sponsors of the event are Prime Motor Group, J.P.’s Shellfish and Piscataqua Landscaping. Supporting sponsors are Shipyard Brew Pub, Jasper Wyman & Son, Cabot Creamery Cooperative, The Greater York Region Chamber of Commerce, Sturgeon Creek Enterprises, LLC, DennyMike’s ‘Cue Stuff, Maine Veterinary Referral Center and Raitt Signs. The media sponsor is Taste of the Seacoast. The festival will also highlight Maine BBQ products from Maine Grilling Woods, Wicked Good Charcoal, Raye’s Mustard and Vic Firth Gourmet. The Raitt Homestead Farm Musuem (www.eliotantiquetractorandengine.org) is dedicated to the preserving farm history and promoting valuable farming heritage. The 33-acre farm on Route 103 in Eliot is only five miles north of the Kittery Outlets. This entry was posted in Uncategorized on August 5, 2009 by galfoodie.